It is difficult to describe today’s experience. I was looking forward to it, as it was one of the highlights of the trip, and it has been a very interesting visit, but at the same time it has been a most harrowing experience. Luda took me to the city’s main square, where the tour bus was to pick me up, and once in front of the hotel that was supposed to be the meeting point, she told me she would be there again at 6 in the afternoon to show me the center a bit. I spotted a bus and a couple of people waiting and I asked the last person in the queue, who was the exact double of Hillary Swank. She was from Sweden, and since her boyfriend had decided not to take summer holidays, she was touring Ukraine on her own for a few weeks. We got on the bus and quickly started to talk about travelling, as we shared a taste for unusual destinations and Eastern Europe. The conversation was soon interrupted by the start of a documentary on the disaster, which turned out to be very interesting and much more complete than other things I had seen before. It finished shortly before we reached the first checkpoint. 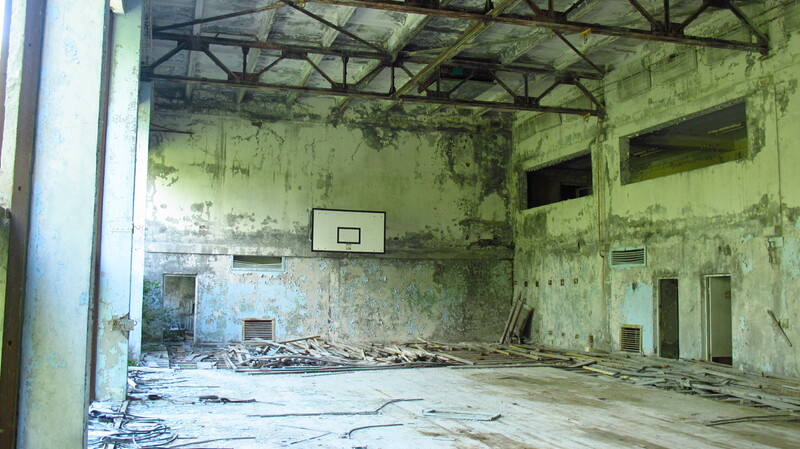 A big area around Chernobyl is still under military control and even though about 170 people, all of them over 70 and retired, have decided to move back to their land, nobody is allowed in or out without going through strict security checks. We got off the bus and after having our passports checked against a list, we walked past the checkpoint and waited for the bus to cross. It was then a short drive to the first and only inhabited town, which hosts about 5,000 people who work in jobs related to security and maintenance of the area. They live and work there for 15 days and then take 15 days off, and have to undergo frequent medical checkups. On the way there, we passed several villages, but the only thing that remained were the road signs, as the military had bulldozed and buried the houses after the disaster and nature had quickly claimed the land back. 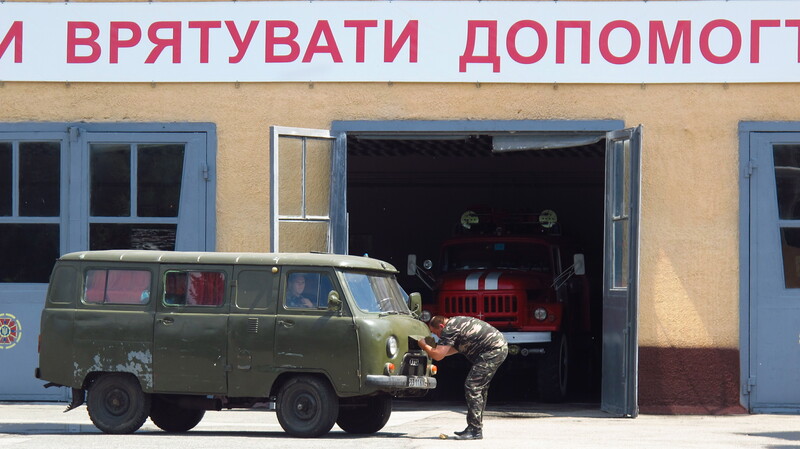 We had a short stop in the town, where we saw a memorial, a fire station (whose members where the 3rd team to arrive on the site right after the explosion) and some of the vehicles that were used for the cleanup. 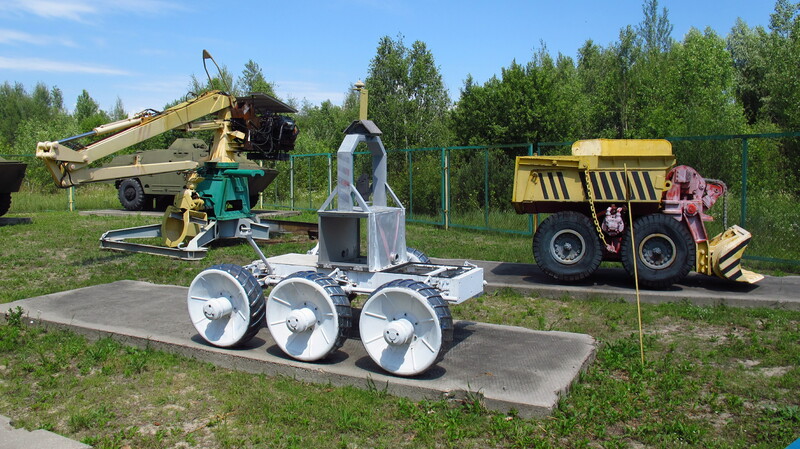 There used to be a bigger collection of vehicles at a place called vehicle cemetery, but they were deemed too radioactive to be safe and that part of the visit had been cancelled years ago and the vehicles buried. Then we drove through another checkpoint to get into the exclusion zone itself, where no people live, even though lots of them work there. 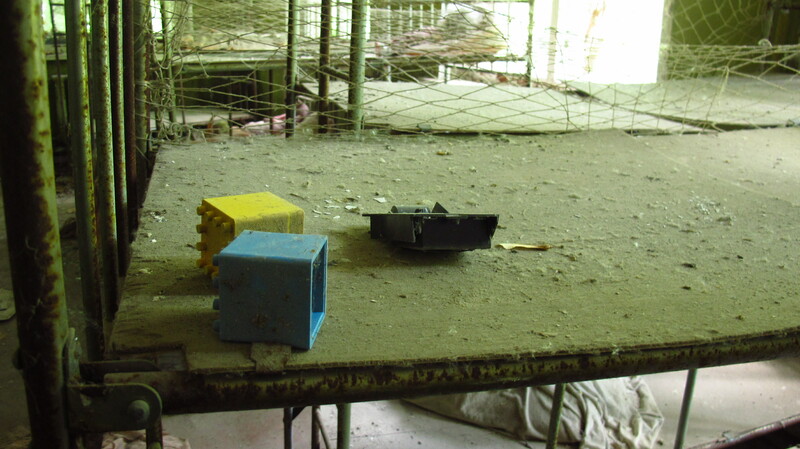 Before reaching the nuclear plant we stopped to see an abandoned kindergarden which, together with a post office that was barely standing among the trees, were the only two buildings remaining of the last village before the plant. Then, as we were driving out of a corner, it came into view into the distance. The high chimney that stood between reactors three and four. 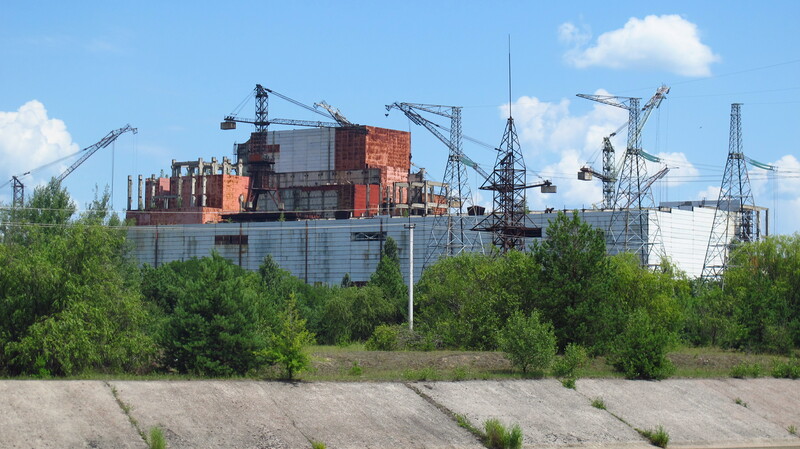 We stopped one last time before reaching it, to see the construction site of a couple of cooling towers and reactors five and six, still surrendered by high construction cranes. They were never finished. The bus stopped on the road and when we got off to take some pictures, the guide told us not to step off the road and onto the grass, as it was highly contaminated. We got on the bus again for the final short drive that took us next to the sarcophagus that covers reactor number three. The structure looked quite old. It was the first and only of its kind, and its construction had taken several lives. The people designing it and working to build it had never done anything like it, and nobody had ever worked or trained to work in such conditions. Thousands of people worked to build that sarcophagus, for no more than one minute at a time to avoid the deadly doses of radiation, and even that way, they all suffered horrific consequences. All of those who were there to contain the disaster gave their lives to prevent a much more dramatic outcome, one that might have rendered most of Europe inhabitable. Some of them knew what they were in for, other were sent by their superiors unaware of the great risk they were running, but without them, the tragedy would have been much bigger. From the first firefighters on the site, to the miners who dug a tunnel under the reactor to pour concrete and stop the melting uranium bars from reaching the water below and exploding, from the people who got on the roof of the number three reactor to clean the highly radioactive pieces of graphite with their own hands to the helicopter pilots who flew directly above the radioactive blaze to drop tons and tons of sand and then lead to try and stop the fire. 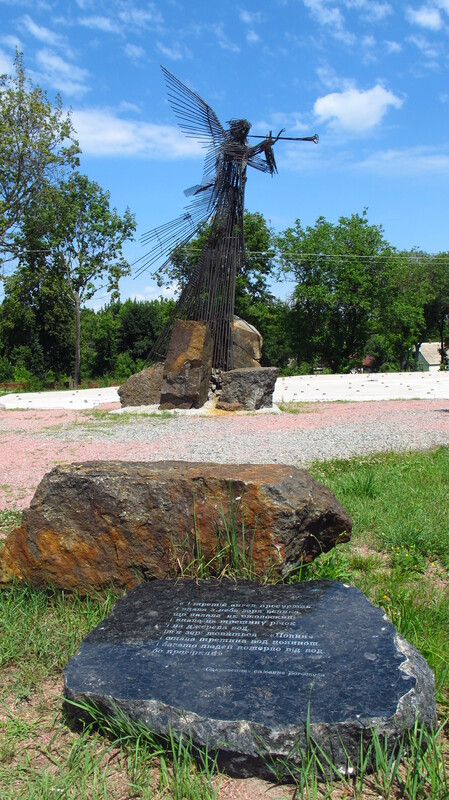 From the people who walked as close as possible to the core of the reactor to get readings to the workers who built the sarcophagus, they are all unsung heroes who saved hundreds of millions of lives and have now been forgotten, left to suffer the terrible consequences their bodies bear for the rest of their lives alone. 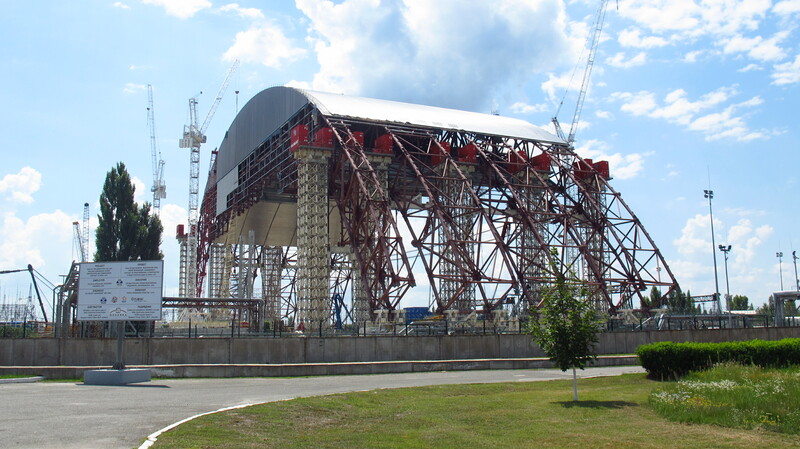 Near the original sarcophagus that covered reactor number three, a French company were busy at work , building a colossal structure – a new sarcophagus that will cover the old one and ensure safety for a hundred years. Its dimensions are hard to appreciate on the pictures, but the red boxes near the top are shipping containers, which gives an idea of the size. And it still has to grow to be twice as tall and twice as long. 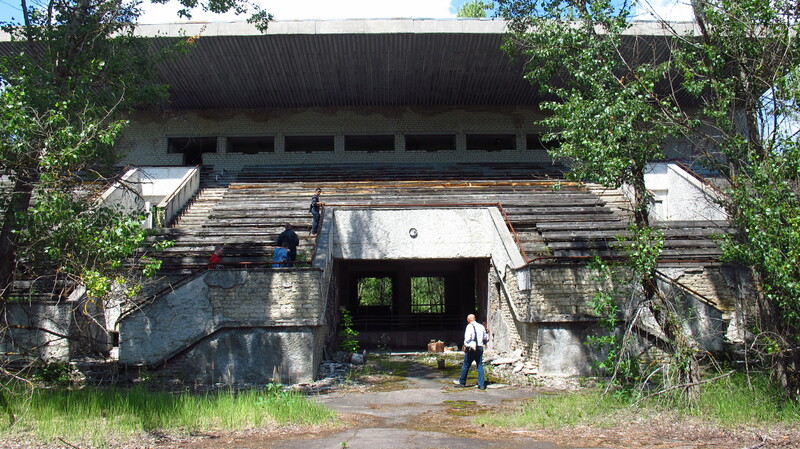 It should have been built about ten years ago, as the old one has long exceeded its useful life, but there were no funds for it. It will be finished in 2015. 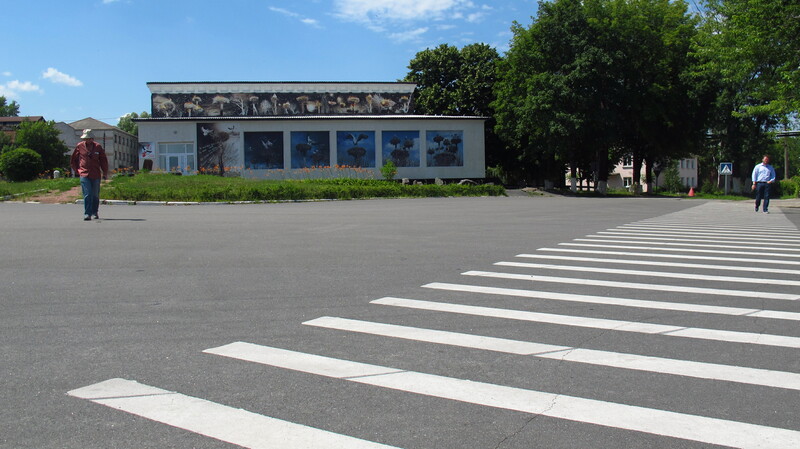 We were told there that we could only take pictures of the reactor and the new sarcophagus, as there were military buildings in the area and we were not allowed to photograph them. In a way, I felt privileged to have had the opportunity to take this tour now, as these visits might have their days counted, at least as they are now. 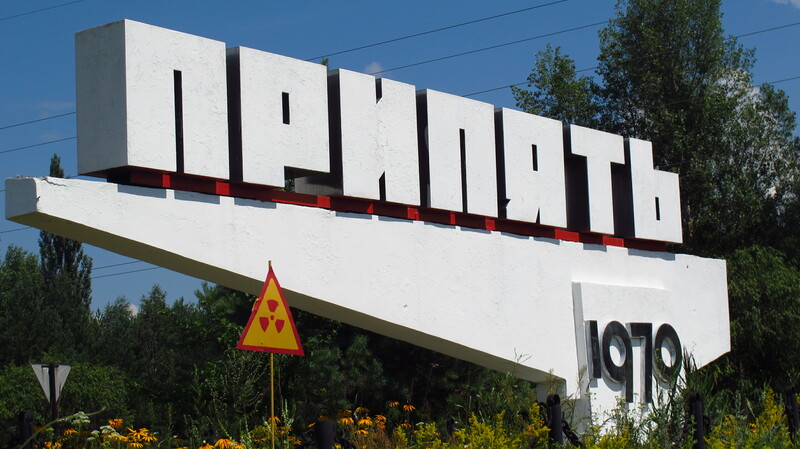 In three years the number three reactor would no longer be visible, buried under its new cover, and the city of Prypyat will have crumbled down and be claimed back by nature. The bus dropped us at what was the main entrance to the city where 50,000 people had lived here at its heyday, all of which were evacuated in two days without being able to take more than a couple of suitcases with them. They were never allowed back to their homes. Today, it was hard to recognize it as an avenue. 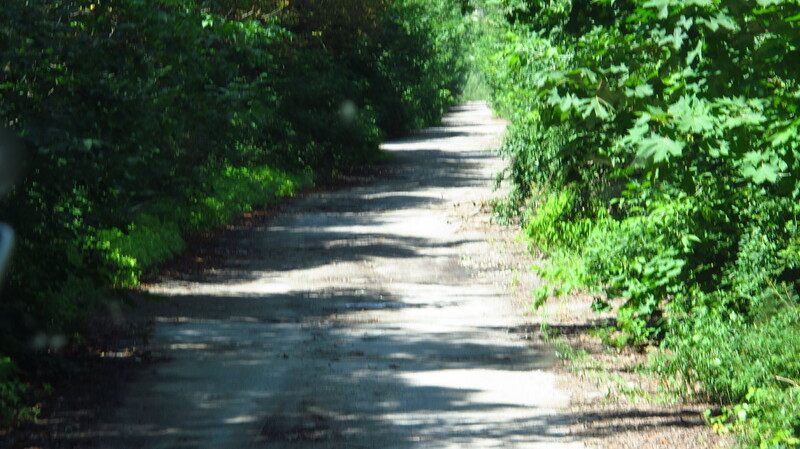 Trees and bushes had grown wild on both sides, reducing it to little more than a dirt road across a forest. The buildings have been abandoned ever since the disaster, so most of them have leaking roofs and are in danger of collapsing at any moment. The bus dropped us off at the main square and we started walking into the city, careful not to touch the plants. 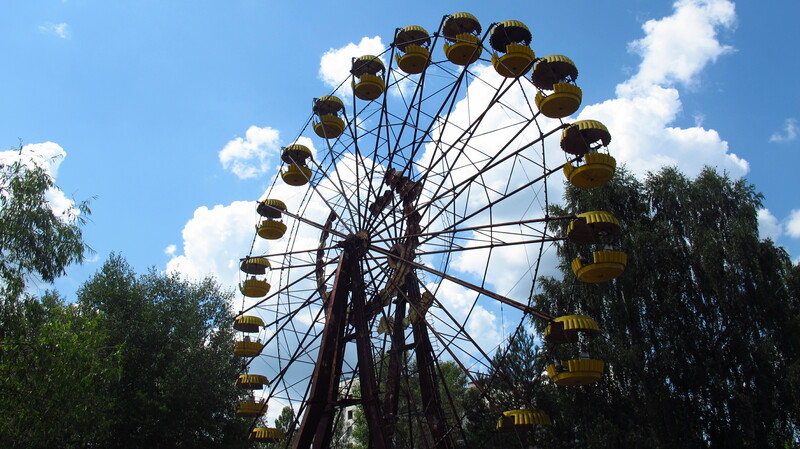 We went around some of the main buildings at the square and found the amusement park, one of the most unsettling and infamous sights in the city, the ferris wheel still standing, frozen in time. From there we went across what looked like a forest until the guide stopped in the middle of thick vegetation and announced that we were standing in the football field in the city’s stadium. Coming out of the trees we found the stands, and that was one of the two buildings we were allowed into. 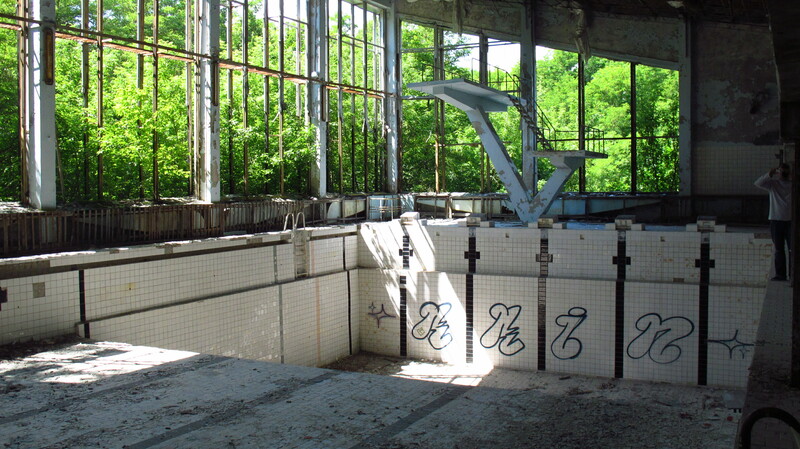 The other one was the sports center, with its basketball court and empty swimming pool. It all made for a fascinating visit. The bus met us again on another avenue almost turned to a trail and took us out of the exclusion zone and to the canteen in the town where present day workers live. We went through a comprehensive anti-radiation cleansing process consisting on washing our hand with an old chunk of soap and then sat down to enjoy a soviet-style meal. After eating, we stopped at the main checkpoint and were made to walk through a radiation check machine that looked like the kind of thing you would expect to see in a cold war movie, Then we were let go, clean as a whistle. On the way there in the morning, there had been an tense silence in the bus, with very little conversation, everybody full of expectation at what they were about to see. On the way back, tension broke, and there was light conversation and jokes. A Dutch teacher who was sitting behind me said that his wife was going to make him throw away all his clothes as soon as he got back to the hotel, and I met an American guy who worked for the CDC who had hundreds of anecdotes to tell about all the places he had been stationed at. Back in Kiev, Luda was waiting for me to show me around the city a bit, as I still had a few hours left. She had brought along a friend who also spoke English, and we went for a bit of sightseeing before heading back home to pack my stuff for the next morning. 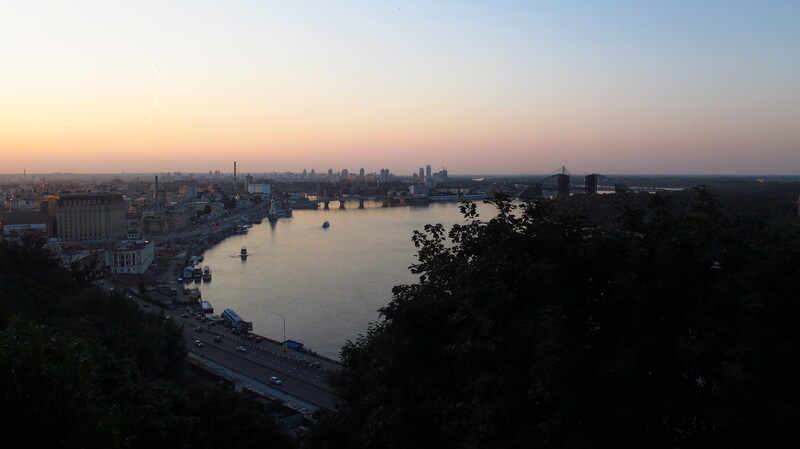 Kiev is an enormous city, an urban sprawl of over 3 million people, far bigger than I had imagined, and it was very obvious that I was missing so many things. I made up my mind to come back and visit it in the future. 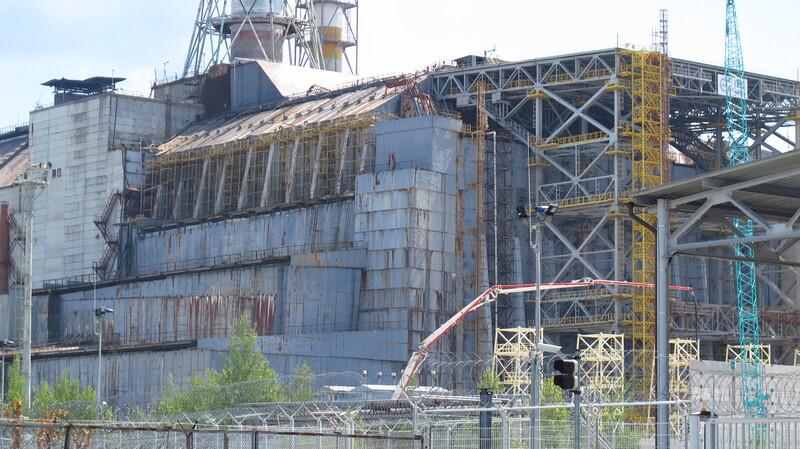 This entry was posted in Stroming The World 2013, Travel and tagged Chernobyl. Prypyat by Kilian. Bookmark the permalink. hello Kilian, struck me very Cernonyl of your report. Poor people!!! ……. If I were a bit ‘younger, you run after me too. Good continuation of the journey. I read with pleasure your reports. Hello Mario (v.strom 650) dolomites areas. Thanks Mario! It was a moving visit, but one that’s definitely worth doing. Ukraine has surprised me in so many ways… I thought I was only riding through to to get to Russia, but it is a very interesting country. Very interesting. A bit creepy. Thank you for this post, Kilian.